"We added a lot of talent, a lot of scoring upside and we added some toughness, some grit and some physicality as well," said Timmins, who was particularly pleased to grab Collberg. "Only time will tell, but right now we're very happy. It's like Christmas Day -- Santa Claus arrived and now we've opened our gifts. Now it's time to get to work to try and help these players develop further to reach their full potential. That's our job now." The Canadiens' next two picks -- Kamloops Blazers right wing Tim Bozon at No. 64 and Windsor Spitfires center Brady Vail at No. 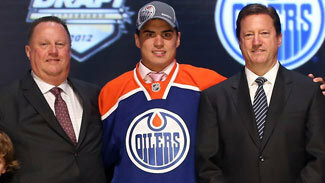 94 – also were projected to be selected far quicker than they ultimately were; they were ranked No. 42 and No. 38, respectively, on NHL Central Scouting's list of North American skaters. The Canadiens opted for Charles Hudon -- No. 95 among North American skaters -- with the 122nd pick. Erik Nystrom was their final selection at No. 154. Collberg looks to be the top prize, with Bergevin projecting him to be "in the top-six with a scoring touch and with character." Timmins said he went to see Collberg practice one day with Frolunda's junior team in Sweden; after a difficult one-hour practice, he was called up to play for the senior men's team that same day, just two hours later. Timmins and Canadiens European scout Christer Rockstrom wound up driving Collberg to that game -- one in which he moved from the fourth line to the second line and acquitted himself nicely. "He's 5-foot-11 and he's really thick and stocky, big legs on him," Timmins said. "He's built similar to Daniel Alfredsson, who I was with in Ottawa, and he plays a similar style of game -- on the puck, really committed and passionate about his game." Collberg played the rest of the season with Frolunda's senior team, but he did not register a single point in 41 games, making it a very frustrating time for a player who has excelled offensively everywhere he's played. Timmins points out that in every tournament Collberg took part in with Sweden's under-18 national team he led the tournament in scoring. Collberg also played ahead of Filip Forsberg, the No. 11 pick in the Draft, while compiling seven points for Sweden's gold medal-winning World Junior Championship team. "I was playing in the big league with the men, and it was a tougher year for me," Collberg said. "It was hard for me. After games I would wonder if I should be playing with the juniors because it's a little easier there, you can have the puck a little more. I was looking forward to the national team, because it was tough for me not scoring with the big team." Ultimately, that lack of production did not discourage the Canadiens. When asked if he was pleased that Collberg was still around at No. 33, Timmins simply said, "Well, I'm smiling." And Bergevin added another factor that played in Collberg's favor. "Throughout my career, I've never played with a bad Swede," Bergevin said. "They're all great kids. They are. They have great hockey sense, they're good people and this guy fits. Honestly, I think Swedes are great." 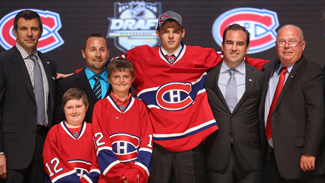 Overall, including Alex Galchenyuk, who was selected at No. 3 on Friday, the Canadiens selected six forwards and one defenseman in the Draft, addressing an organizational need after focusing on defensemen the past few years, though Timmins insists he did not consider a player's position when making a pick. The one position the team wanted to address was goaltender, but they weren't able to get one they liked at an appropriate spot. It was Bergevin's first big event as the new boss in Montreal, and it marked the beginning of a period in which he will be able to make his mark on his club. "He's like a team captain," Timmins said of his new boss. "He's an outstanding leader and a great person." While Bergevin largely deferred to Timmins at the draft table, it was clear that the GM's own player evaluations were taken into account. When asked Friday how he knew Galchenyuk had the character necessary to become a star, Bergevin said, "By the look in his eyes." Again Saturday, a brief moment Bergevin witnessed had an impact on his club selecting Thrower. "I saw him play once at the prospect game in Kelowna, and he went after the kid [Thomas] Wilson from Plymouth, one of the biggest kids in the Draft," Bergevin said. "I remember thinking, ‘Who's this kid?' So there was no way we were going to pass on him." Bergevin says he is hopeful the Canadiens will be able to re-sign their key restricted free agents in the coming week; the list includes goaltender Carey Price, defensemen P.K. Subban, Alexei Emelin and Raphael Diaz, and forwards Lars Eller and Ryan White. Bergevin did not sound as though he will be overly active when free agency opens July 1, but said he will be listening. He's also had some discussions with his own unrestricted free agents -- a group led by rugged forward Travis Moen. Now that he's added a number of new faces in the front office and behind the bench, the next few weeks will be the first opportunity for the team's loyal fans to evaluate Bergevin's work. He sounds up for the challenge. "I feel that our staff is excited," Bergevin said. "It's a new start. Sometimes change can be hard, but I think it's being taken in a positive way."